This destination guide will help you learn about the Cerro Bayo Ski Resort located near the charming village of Villa La Angostura, Argentina. Let’s get started, the Cerro Bayo ski season opens in June! The small ski resort of Cerro Bayo is situated inside the Neuquén Province of rugged Argentine Patagonia. The closest town to Cerro Bayo is Villa La Angostura. The two sit a mere 6 miles apart from each other. Outside of Villa La Angostura, the two closest cities are San Carlos de Bariloche, which is just over 1 hours drive to the southeast, and San Martin de los Andes, which is 2 hours to the north. Getting here is pretty straightforward. We break down the options here. To reach the town of Villa La Angostura from Buenos Aires, it is best to take a plane from the capital to the airport in Bariloche. This flight is a mere 2 hours long, and operates several times each day, every day of the week. From Bariloche airport, Villa La Angostura is an hour away. It is easy to rent a car at the airport in Bariloche, or travelers may take the short journey in a public bus from the bus terminal outside of Bariloche. As mentioned, Cerro Bayo Resort is located just 6 miles (9 km) away from Villa La Angostura. The drive between the ski resort and town is fairly easy, although portions of the road connecting the two are unpaved and riddled with pot holes. Fortunately, the road is not at all steep. You can get there via private vehicle, hire a taxi in town, or additionally, there are several van shuttles that provide door-to-door service between hotels and the resort. Cerro Bayo offers some of the greatest views Patagonia has to offer. Provinciales, Inacayal, Cerro Belvedere are all amazing. Alpine lines and Patagonian tree skiing at its best, but heads up for the bamboo! 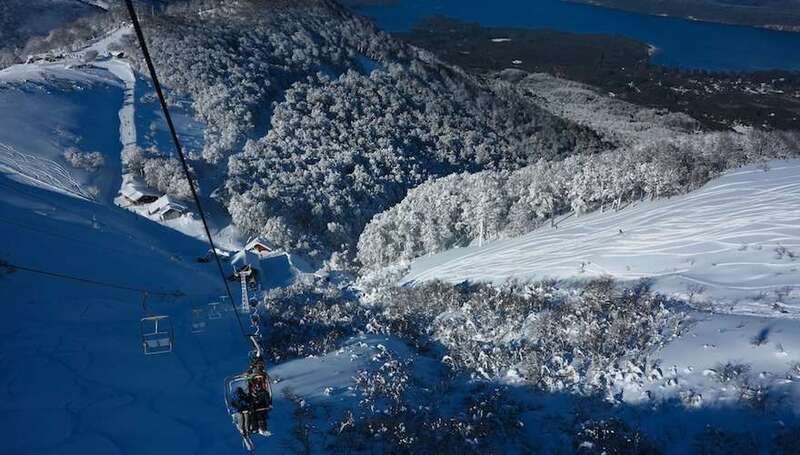 An hour away from the hustle of Cerro Catedral in Bariloche, the Cerro Bayo Ski Resort is the complete opposite experience – it’s a small ski center, minimal crowds, with 13 lifts, including 2 gondolas and 22 pistes (groomed slopes). With the 2013 opening of the Cumbre Gondola, there has been an expansion of over 200 hectares (500 acres) of off-piste terrain to explore, previously only accessible by hiking or ski touring. It is important to note the gondola does not always operate due to winds, power grid issues or just simply the “Argentine Factor”. The ski area is just a 15 minute drive away from the small Argentinean town of Villa La Angostura, which is a quiet touristic village, close to the Chilean border. Villa La Angostura has a mix of high end shops to pick up some unique Patagonian gifts. The village also has dozens of hotels and cabins ranging from basic to 5 star. For such a small town the restaurant options are outstanding. Many of Argentina’s top chefs have relocated here, and have opened an impressive series of slow-food style restaurants. For those on a budget, you can find inexpensive pizza, grills, empanadas and sandwich bars offering quality local food at a fair price. What is The Ski Terrain Like at Cerro Bayo? As well as a nice beginner’s park located on run 18 featuring beginner rails, boxes and airs, the main terrain park for intermediates to experts sits between the trees and has the nice addition of beanbags and sofas for relaxing and listing to fresh tunes. Another gem tucked away in Patagonia. Cerro Bayo’s tree runs and easy to access backcountry bowls are some of the best around when the conditions are right. A short gondola ride (when operating) will get you to the increasing popular off-piste zone, Provinciales. If you want to get further out and into some true backcountry it is advised to go with a certified ski guide. You won’t be fighting for fresh tracks here and most of the slack country and backcountry runs loop back into the basin of the resort as long as you know the exit. Intermediate skiers and riders will find a trail system and a mix of on and off-piste terrain from wide open slopes to glades and tighter tree runs through the Lenga forest. The Cerro Bayo snowboard and ski schools offer certified local instructors. The ski center has a small zone for beginner skiers and snowboarders located at mid mountain, known as 1500. With outstanding views of the surrounding national parks, its an unforgettable place to learn to slide on snow. Not skiing? As well as snowshoeing, the resort hosts a few unusual activities for spectators such as snow-polo (yes, with horses) and extreme rugby. For updated snow conditions and current weather check out Snow-Forecast to get a general idea of what to expect over the next few days. Inbound Terrain: 25 Runs with 14 km of skiable groomed slopes. Weather: This is Patagonia! 4 seasons/day. Come prepared. The PowderQuest team first stumbled upon Cerro Bayo, Argentina on an exploratory trip in 1999. The next season we returned with a crew of pro riders and photographers from Snowboard Canada Magazine and Chasing Winter Productions. We scored waist deep dry powder and endless untracked runs for two days. 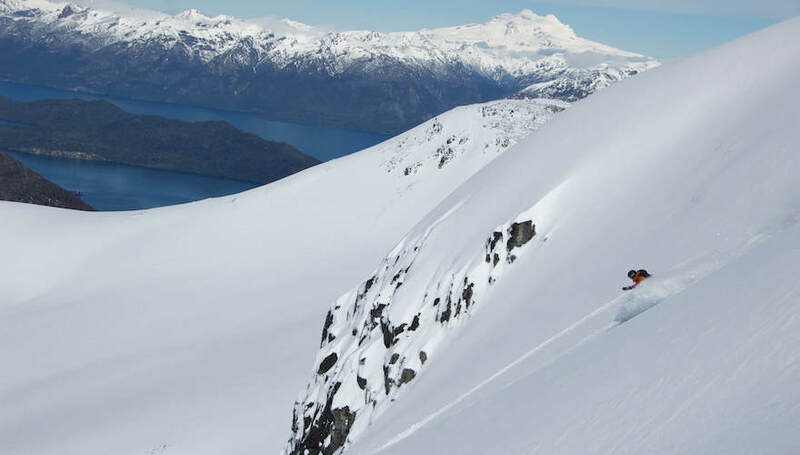 It was a no brainer to add this Patagonian ski destination to our guided tour itineraries. Cerro Bayo was built up as a small, family-run resort by Belgian, Jean Pierre Raemdonck. In 2007, the same year that it hosted the 2nd South American Ski Mountaineering Championship, it was sold to a private investment group. Now marketed as an upscale “boutique” resort, it has a way to go and still retains the rustic feel that we found 20+ winters ago. For years, Cerro Bayo has been talking of a plan of expansion and additional investment, including rumors of a well needed paved access road, a gondola from the town of Villa La Angostura and more lift accessed terrain expanding into the off-piste Provinciales zone. However to date, it all seems to be a lot of false promises. Currently there are 6 places to eat on the mountain. 2 at the base area and 4 at 1500 meters. There are runs that take you all the way through the treeline, and a 6 km panoramic trail where you can take in the amazing views of the nearby Nahuel Huapi Lake. The real jewel of Cerro Bayo is the easily accessed backcountry with steep bowls and some of the best tree runs in South America amid spectacular virgin forests. So, there we go with our run down of the Cerro Bayo ski area. Well worth the visit, especially if you are looking for something more off the beaten track from the other ski areas in Argentina and Chile.